This is a club from The Young Turks show, an American internet show which critiques the news from a left-wing perspective. In this clip their anchor, Cenk Uyghur, praises three of the most outstanding people during the Islamist attack on the free speech presentation and the synagogue in Denmark the other week. One of them was the synagogue’s security guard. Another was a woman at the free speech meeting, who after the shooting had stopped, got up and resumed her presentation. The third was a young Muslim woman, Hajrad Arshad, who was so shocked at the atrocity that had been committed in the name of Islam, that she got 450 other Muslims to form a ‘peace ring’ around the synagogue in Oslo. She said she did this to combat prejudice against both Jews and Muslims. These are three truly inspiring people. And so long as there’s people like them, the bigots and murderous fanatics of whatever stripe will never win. This is far from being the first time this has happened. Private Eye in their ‘In the Back’ column has numerous examples of private firms being awarded NHS contracts, despite charging much more than the local NHS trust. And Rifkind is certainly not the only Tory MP with a post working for a private medical firm: there are about 92 Tory and Lib Dem MPs working for such companies, and who stand to gain materially from the NHS’ privatisation. See the lists published by Mike over at Vox Political, and the Angry Yorkshireman. Once again the Tories prove the truth of their nicknames ‘the Self-Servatives’. And they are very definitely for the ‘privileged few’. The government, however, hasn’t said why the firm – Alliance Medical Group – won the contract despite its bid being so much more expensive. That’s because the bidding process was for some reason secret. 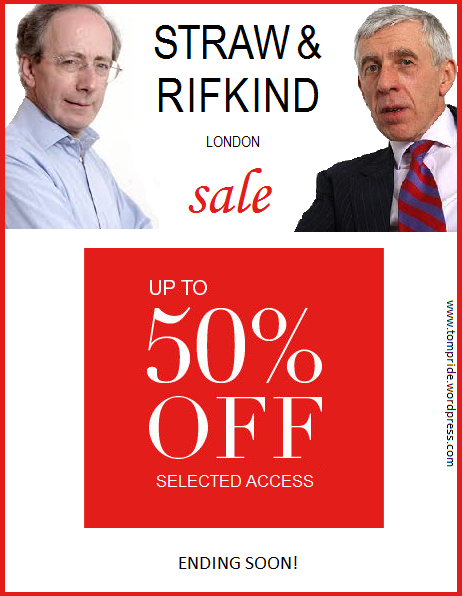 This, of course, has absolutely nothing to do with the fact that a director of the firm is none other than disgraced ‘cash for access‘ Tory MP Malcolm Rifkind. The government seems to have a remarkably lax view of the security threat posed by Chinese investment, and Rifkind is certainly not alone in this. It seems to be official Tory policy. A little while ago Private Eye mentioned the security implications of Huawei gaining an important government telecoms contract. Huawei is a Chinese company, which also does work for the Chinese military. Despite this obvious security risk, the government felt that it was perfectly acceptable to be given the contract for government work in this country. It makes you wonder precisely who the government are working for. Once upon a time, when entrepreneurs of foreign extraction were particularly successful, the Tory Right immediately screamed that they were a threat to security. Like the German Jewish industrialist Mond during the First World War. But as all this is being done by pukka old Etonian aristos, it’s all perfectly acceptable and in Britain’s interest. I found this spoof manifesto for UKIP’s Royston Vesey branch over at the SlatUKIP facebook page. It follows the video someone put up on Youtube of clips from the Beeb’s Meet the Ukippers with the theme music and Tubbs and Edward from the League of Gentlemen. The problem with this, is that it fits UKIP only too well. They are indeed a ‘local party, for local people’. Or a Nigel Farage might say to new members, ‘You’re my wife now, Dave’. It’s not true at all that the Cameron government isn’t tackling tax fraud. In fact, it has even brought in a US company – called Concentrix – to help HM Revenue and Customs and is paying the firm millions in taxpayers’ money to tackle tax fraud. But Concentrix has been ordered to tackle possible tax fraud committed by working people so poor they need tax credits to survive – not rich corporations or individuals who are evading or avoiding tax. In the meantime, George Osborne claims it’s not his or the government’s job to tackle tax fraud by the wealthy. There are increasing demands for Malcolm Rifkind MP to be removed as the chairman of the House of Commons Intelligence Committee after the cash for access scandal proved conclusively that he doesn’t have any. I found this article in Private Eye’s edition for 30th May – 12th June last year (2014). It’s about fraud committed by yet another welfare-to-work company, Seetec. Urgent questions are being asked at the Department for Work and Pensions over a failure to investigate properly allegations of fraud by Seetec, which has various DWP contracts to help jobless people find work. Officials assured two whistleblowers last autumn that the department would investigate claims that Seetec had been artificially inflating the number of jobs it was finding for its disabled clients through the Work Choice Scheme – and pocketing the profits. The two former Seetec employees claim that the company would offer Work Choice clients as “free” labour to charities and other host organisations. Seetec would then pay their wages for the next six months, while telling the DWP that the salaries were being paid by the host organisations. They alleged that Seetec profited from the scam because the amount it received from the DWP – thousands of pounds for every client who “completed” six months’ work – was far more than it paid the clients. (Seetec only had to pay for 20 hours a week at minimum wage to secure payment from the government for a successful outcome). Three organisations the whistleblowers said were unwittingly used by Seetec in the scam have confirmed that they accepted disabled job-seekers as “volunteers”, even though it was made clear that there would be no jobs available at the end of the six months. The DWP now says it has completed its “investigation” into the claims and that Seetec – which as the last Eye reported is the worst-performing of the eight Work Choice contractors – has been exonerated of any wrongdoing. However, neither of the two whistleblowers was interviewed by DWP investigators, even though they offered to give evidence. Asked how it could give Seetec a clean bill of health without gathering evidence, a DWP spokesman claimed there was no reason to interview the whistleblowers because they had supplied all the necessary information in emails. In fact they had provided no detail at all. The email sent by one of the whistleblowers to the DWP last year (and passed to the Eye) includes only a 100-word summary of the allegations – just four sentences. “As I understand it, the information they provided was investigated,” said the DWP spokesman. The investigators found there was “not fraud” he said, he said. Seetec itself declined to comment. But Margaret Hodge, the no-nonsense chair of the Commons public accounts committee, is now demanding answers from the DWP’s permanent secretary, Robert Devereux. Watch this space. If Seetec were committing fraud, they were hardly the only company. I’ve reblogged several pieces from Private Eye reporting cases of fraud by the welfare-to-work industry, including an examination of the conditions of their contracts, which concluded that they could only succeed through bail-outs. The loan by company of claimants to charities as unpaid ‘volunteers’ also confirms the view of this blog and others, especially Johnny Void, that these schemes only exist to provide cheap labour to industry and depress real wages. And as Johnny Void has also pointed out, you are far more likely to get a job on your own than through the welfare-to-work companies. This whole industry needs to be stopped. Now. I found this report from Private Eye’s edition for 1st October 1999 on Empower America’s award to Rupert Murdoch’s for his contribution to American culture. When Rupert Murdoch was awarded the Humanitarian of the Year award by an obscure American body two years ago, this well-deserved tribute received copious coverage in his newspapers. Strangely there has been no mention of his latest triumph: being “dishonoured by right-wing media lobbying group Empower America. Even before Murdoch’s 20th Century Fox releases Brad Pitt’s sick new film, Fight Club, Rupert has scored a double, picking up two awards. He wins the third annual Silver Sewer Award for his “outrageous contribution to the degradation and coarsening of our culture and unswerving dedication to the pursuit of profit above principle.” And he also picks up a “Lifetime Achievement Award” for his “personal role in the corrosion of American values”. I’m very pleased to remind the world of Murdoch’s prestigious achievement at the same time TV is still covering the glitz and glamour of the Oscars. Conservative support among Christians has dropped by a third since the last election, in new research that will lend weight to the Tories allegations of a left-wing allegiance in the Church. Almost 40% of Christians surveyed by the Evangelical Alliance said they intended to change who they vote for in this election, and both the Conservatives and the Liberal Democrats have seen significant drops in support from a community where almost double the national average intend to vote. The Faith in Politics? report follows a survey of 2,020 evangelical Christians, conducted by the Evangelical Alliance between August and September 2014, shows that poverty and inequality is the single most important issue for evangelicals, compared to only 4% of the general population saying the same. The article states that this will lead to fresh accusations about left-wing bias in the churches after the Anglican bishops’ 52 page letter to prime minister, which included topics such as the European Union, Trident and welfare. Indeed, Nadine Dorries has attacked the bishops’ letter for its supposed left-wing bias. Christian support for the Greens and UKIP has increased massively, while the Tories have lost a third of their support and the Lib Dems half. The party that now has the largest Christian support is the Labour party, according to the Huff Post. This will doubtless enrage the Tories, who have since Thatcher’s administration attacked the archbishop of Canterbury and any other cleric for being ‘left-wing’ whenever they criticised the government since Maggie Thatcher. The Cranmer blog for Conservative Christians, mostly Anglicans, was deliberately set up to muster their support for the Tories. If this latest attack on the Tories’ attitude to poverty follows previous criticisms from the churches, you can expect the Tories, in addition to moaning about left-wing bias, to start ranting about how the clergy should keep to preaching Christianity, and if they did, their congregations might start going up. That’s the line they used to take under Thatcher. It isn’t about simply preaching Christianity. It is about living the Christian life, and manifesting Our Lord’s concern for the poor and marginalised. I am very much aware that some Tories are deeply religious, and give generously to charity. A survey in America found that politically Conservative Christians gave far more to charity than secular liberals. Surveys have also shown that, in contrast to the popular perception of theologically conservative protestants – Evangelical Christians, half of them are left-wing, with many being much more Left than American Roman Catholics. Part of the change in political attitude amongst British Evangelicals may well come from experience working for charities and especially food banks. Many churches have started collecting food for them. This experience brings you face to face with the poor and starving in Britain today, as the blog Diary of a Foodbank Helper documents. The Tories, however, have consistently denied that such grinding poverty exists, and, indeed, the need for them at all. A succession of Tory MPs and apparatchiks have opened their yaps to claim that people are only using food banks, because they’re offering free food, not because they’re starving. This is an egregious lie, as you have to have a chit from the jobcentre stating that you are absolutely poor in order to go to them. Such lies are an effective slap in the face to the people, who give to food banks, and who work there. As a result, many Christians are rightly turning their backs on the Tories and their Lib Dem collaborators, and seeking out other parties with better attitudes to poverty. You are currently browsing the Beastrabban\'s Weblog blog archives for February, 2015.